Carsons (CARS) and Bukit Darah (BUKI) attracted investors upon announcements on subsidiaries, Selinsing (SELI), Shalimar (Malay) (SHAL), Good Hope (GOOD) and Indo Malay (INDO), which helped to boost All Share Price Index (ASPI) on Friday the 25 February 2011. The market exhibited mixed sentiments for the week with ASPI gaining 0.51% and MPI shedding 1.01%. The All Share Price Index (ASPI) closed at 7,711.62 points, rose up 1.69% through 128.20 points and the Milanka Price Index (MPI) of more liquid stocks closed at 7,169.35 points, dipped 0.09% by 6.71 points during the day. 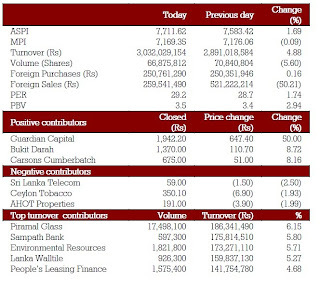 Turnover was at Rs.3 billion topped 4.88% and a total volume of 66.8 million shares changed hands 9dipped 5.6%). Foreign purchases appreciated 0.16% to Rs.250.7 million and foreign sales dropped 50.21% to Rs.259.5 million. Meantime, the Price to forward Earnings Ratio (PER) appreciated 1.74% to 29.2 times. Bank, Finance & Insurance and Manufacturing sectors were the highest contributors to the market turnover while sector indices increased by 0.26% and 0.14% respectively. Piramal Glass made the highest contribution to the market turnover while the share price increased by Rs.0.60 (5.88%) and closed at Rs.10.80. 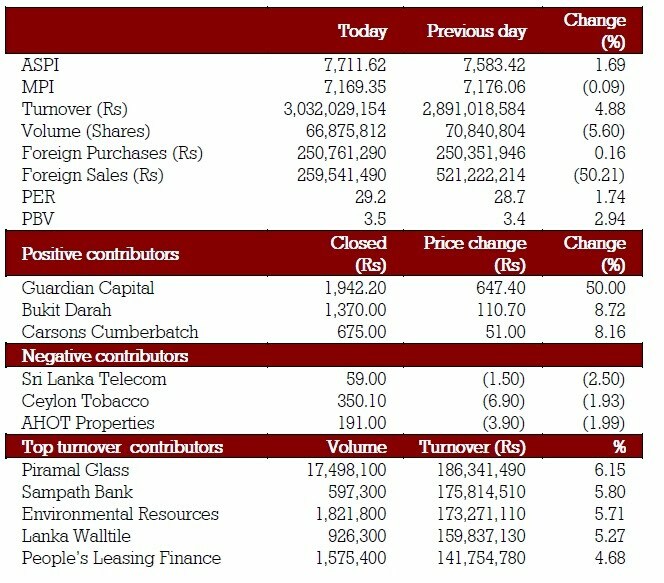 Several crossings were recorded including three crossings of Sampath Bank (SAMP) 295,000 shares at Rs.291.50 and 200,000 shares at Rs.300, three crossings of Lanka Walltile (LWL) 150,000at Rs.172 and 300,000 shares at 173, John Keells Holdings (JKH) 205,000 shares at Rs.290, Tokyo Cement Non-Voting (TKYO.X) 1 million shares at Rs.41, Asian Hotels and Properties (AHPL) two crossings 210,000 shares at Rs.191 and Ceylinco Insurance (CINS) 50,000 shares at Rs.550. Colombo Dockyard (DOCK) announced a first and final dividend of Rs.8 per share. Globally, Most Asian markets rose as investors snapped up beaten-down shares after an overnight retreat in crude-oil prices. Nekkei rose 0.7%. Sri Lankan Secondary Debt Market Treasury bond yields were slightly mixed, while the market activity was relatively low. Sri Lankan Rupee depreciated as the exchange rate was recorded at Rs.110.78 to Rs.110.80 per US Dollar.